Ongoing construction work near two MetroLink stations will affect the evening commute times for some Red Line and Blue Line customers this week. Metro will operate trains on a single track three nights this week. Starting tonight, January 3, at 8 p.m. through the end of service tonight, Wednesday night, and Friday night, MetroLink will implement single track operations near the Grand or East Riverfront MetroLink Stations. Blue Line service will be modified to accommodate single tracking. Tonight and tomorrow night, Blue Line trains will ONLY operate from the Forest Park MetroLink Station to the Shrewsbury MetroLink Station. Blue Line passengers should allow an extra 15 to 20 minutes for their commutes with Red Line customers seeing 5 to 10 minute delays. On Friday, January 6, Blue Line trains will ONLY operate from the Shrewsbury Station to the Civic Center Station. Blue Line riders should add 10 minutes to their trips. Red Line passengers will not be affected. Starting at 8 p.m. until the end of service both nights, Red Line trains will operate on a single track through the area of the Grand Boulevard Bridge so contractors can work above the tracks at the Grand MetroLink Station. Red Line and Blue Line customers should plan for longer commute times. Customers are reminded that the Grand MetroLink Station remains closed for construction. 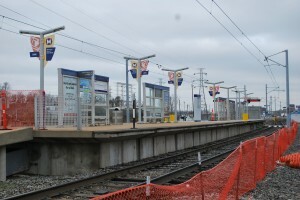 Blue Line trains will only operate from Forest Park MetroLink Station to the Shrewsbury MetroLink Station. Westbound Blue Line passengers traveling between the Fairview Heights MetroLink Station and the Central West End MetroLink Station should board a Red Line train to Forest Park to transfer to a Blue Line train. Eastbound Blue Line passengers traveling between the Central West End MetroLink Station and the Fairview Heights MetroLink Station should board a Red Line train at Forest Park to continue eastbound. Blue Line passengers traveling east of the Forest Park MetroLink Station should plan for 15 to 20 minute delays. Red Line customers can expect delays of 5 to 10 minutes. Beginning with the 7:21 p.m. westbound Red Line train departing from the Shiloh-Scott MetroLink Station, all westbound trains will be delayed five minutes from the posted schedule times. For example, the 7:21 p.m. train will depart Shiloh-Scott at 7:26 p.m. Starting at 8 p.m. until the end of service, Red Line trains will operate on a single track at the East Riverfront MetroLink Station to accommodate crews working near the station. Red Line service will not be affected. Blue Line trains will only operate from the Shrewsbury MetroLink Station to the Civic Center MetroLink Station. Blue Line customers should allow 10 extra minutes for their commutes. Westbound Blue Line passengers traveling between the Fairview Heights and the Civic Center MetroLink Stations should board a Red Line train to the Civic Center MetroLink Station to transfer to a Blue Line train. Eastbound Blue Line passengers traveling between the Civic Center MetroLink Station and the Fairview Heights MetroLink Station should board a Red Line train at Civic Center to continue eastbound.